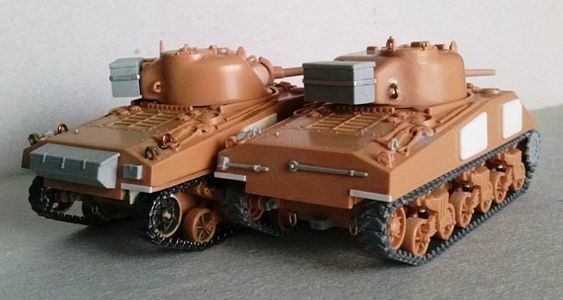 The kit contains two identical moulds depicting a couple of simplified mid production M4A2 with cast hoods; pistol port turret and M34 mount. 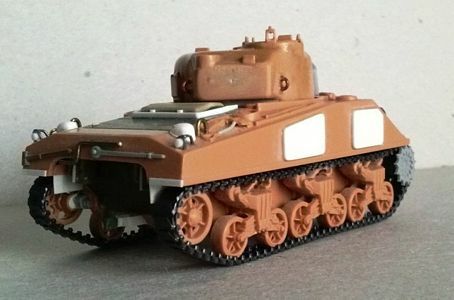 The bow antenna bracket is similar to the type used by the M4A2 of Pullman Standard (this plant used also the "D" type), ALCO (but their M4A2 had only the direct vision hoods) and is quite similar to that used by Federal Machine & Welder. The difference with the original is in the cast base and in 1/72 is barely visible. It is also quite similar to those used in the M4 production by the Pullman, ALCO and PSC plants. 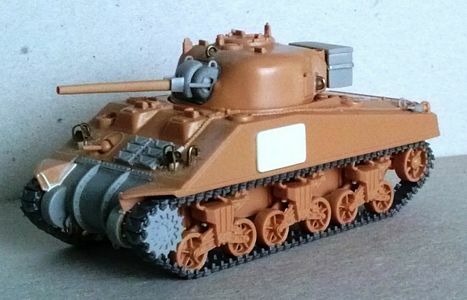 Each tank is composed of twelve pieces and an optional British turret bin (the type used in North Africa and in Italy). The generic dimensions are correct and there is a good amount of details already moulded in place. 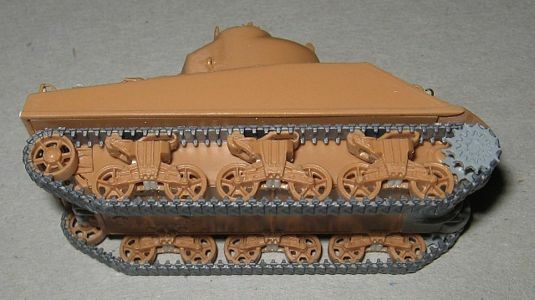 The kit's worst parts are the tracks and the sprockets. Every other part is useful as it is or with little work. It's a good kit for beginners and war gamers. Being fundamentally correct, it can be used as a display model with some spare parts and detailing works. It is suitable also for conversions or other project (like replacement for the Trumpeter upper hull, for example) like an aftermarket item but having the advantage of the low price. 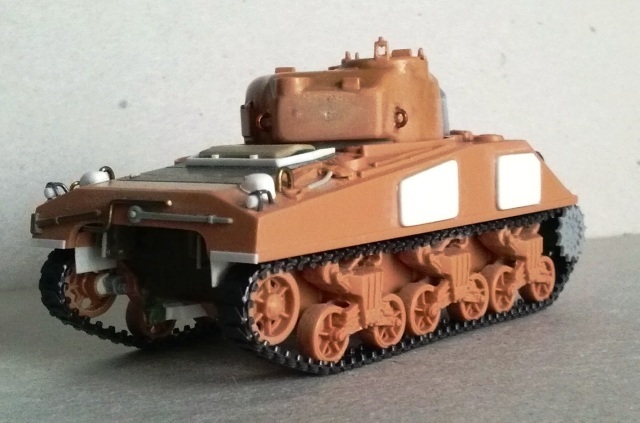 I've used it with good results (I think) to make two Sherman III, a Baldwin M4 and an ALCO/Pullman Standard M4. If a M4 deep wading set is used a spare engine deck and rear lower plate aren't needed. The lower bustle part is missing (because a moulding problem) leaving an open space. I closed it with plastic and putty, shaped in place with a file and sand paper. The molded lifting points were replaced with metallic wire. The M34 mount ones are near the mantlet, like in the first M34 mount type. Later production had the lifting points farther. The kit M34 mount is good, the co-axial MG has a bullet shield. If this is not needed the barrel can be replaced with stretched sprue. As alternative the mount can be replaced with an M34A1 mount from the spares box. The cupola MG barrel holder needs to be drilled if kept. I left my turret hatch closed. Opening it is quite easy, however. The split hatch need to be scratch built if a spare one is not available. My tanks fought in Normandy, so I replaced the kit turret bins with the North West Europe campaign type. They were scratch built. I removed the sandskirts being unnecessary for my models. However the removable front fenders are not enough sloped and if kept need to be corrected. They need to be thinned. Along the sides I left just a millimetre of them to depict their hull supports. The transmission cover flanges are missing the bolts and the assembly need some filling and trimming before gluing. To have a better result I removed the flanges to be able to trim better the curved plate and then they were replaced with 1.0 x 1.0 mm plastic rods. After this, the bolts were added with thin rounded plastic rod segments. Finally I added the towing points. As an option it can be replaced with another one from the spare parts reserve (cast or bolted). Every towing point received their "U" hooks made with metallic wire. The front fenders received their structures. The lights were erased with their brush guards and replaced with spare parts or scratch built pieces. The lifting points were replaced with metallic wire. The rear plate tools were removed and replaced with spare parts. The large exhaust pipes were replaced with sprue segments to have a full rounded section. The holes were deepened. The towing hook base was removed and replaced with a bent plastic strip. A hook can be added. 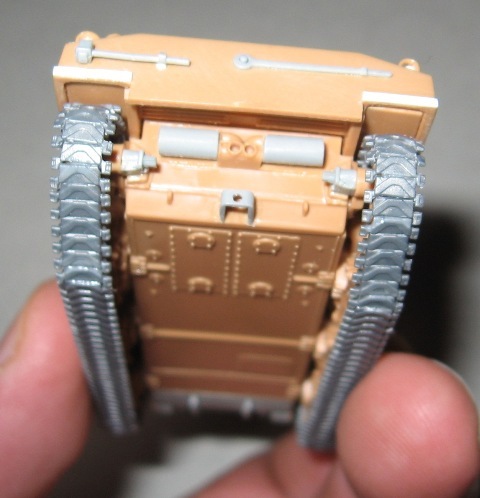 The track tensioners are missing; they were added with spare parts (from Dragon kits, but present also in the UM kits). The towing cable is moulded on the hull. Because of the corrections, parts of it were erased. The missing parts were replaced with scratch built segments with the endings. If needed, the appliqué armor must be made with plasticard. A good source is here. I carefully removed the tracks. The bogies were drilled from the bottom, between the wheels, and then the hole was squared with a sharp blade. Two plastic rod pieces were glued in the middle. The tracks around the idler were removed too and, after being cleaned, the wheels glued aligned with the bogies ones. The sprockets were replaced with spare parts. Usually a big problem to solve is to find a couple of spare track set. 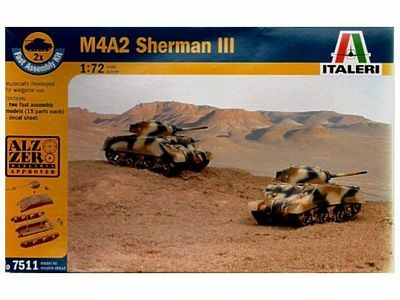 As far as I know, only two kits give us such opportunity: the Dragon M4A1 and the Italeri M4A1. 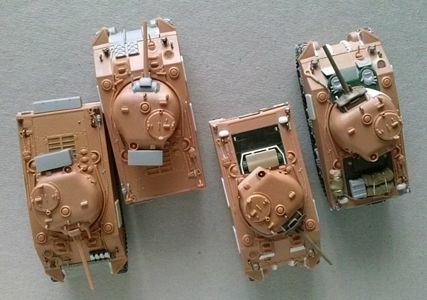 I made some Italeri kits in the past and I had those in my spares box. Recently I solved the well known gluing problem of the Esci polyethylene tracks with a Loctite two component product, so I could use them. The decals provided are generic and not referred to specific tanks with the film thick and glossy. No divisional badge or Arm of Service numbers are provided for the British tanks, no troop numbers for the Squadron squares and triangles, black "T" numbers are in the Mk III range. There are four scorpion badges for a pair of Polish tanks in Italy (2nd Polish Armoured Brigade, 4th Armoured Regiment). 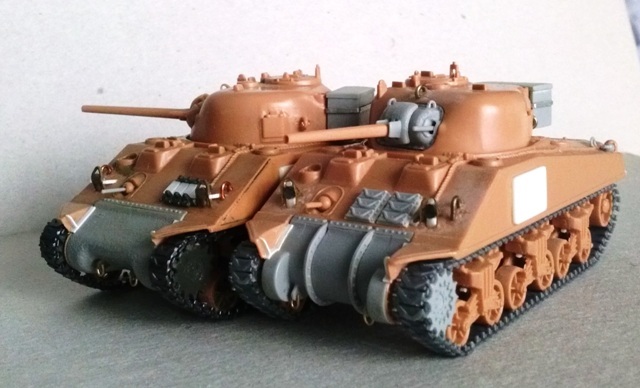 For a couple of French tanks, only four "drapeau consulaire" (1ère D.B. and 5e D.B.) are provided. The U.S. serials 30103358/359 are in a 300 M4A3 105mm batch range, while 30471522/523 looks too high for any Sherman tank and are not present in the serial list of the sources consulted. Good for war gamers and better than nothing, not so good for a modeller if not joined with others and matted with a transparent finish. Obviously there are better M4A2 (and M4) display kits and the declared finality of this kit is for war games, not to make a display model. Anyway it is fundamentally correct and in my opinion some details of this kit are better than some display models. 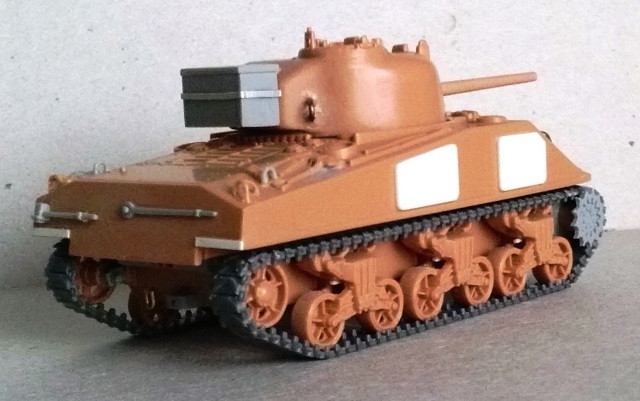 In this sense this kit is suitable for some use if your spare parts box is packed with unused pieces, to obtain a pair of low cost (but still good) models with the right amount of elbow grease.